Over the past couple of weeks, WWE has made plenty of media appearances to promote the 25th Anniversary of Raw, which is scheduled to air on Monday, January 22. Recently, Triple H and Stephanie McMahon were on an episode of the Tonight Show to compete in a lip sync battle against host Jimmy Fallon and SmackDown Live stars Big E, Xavier Woods, and Kofi Kingston of The New Day. New Day, Fallon, Stephanie, and Triple H all picked a song to sing. Fallon chose “Billy I Got Your Number” by Phil Collins, New Day chose “Motownphilly” by Boyz 2 Men, Triple H chose “Seek and Destroy” by Metallica, and Stephanie chose “How Far I’ll Go” from the movie Moana. Both New Day and Stephanie McMahon’s songs won. Fallon and New Day went up first, singing “Motownphilly.” In hilarious fashion, New Day started and tagged in Fallon to lip sync his part. Throughout the song, New Day were trying to be synchronized in their dance moves while singing, but did not manage to perfectly execute their plan. 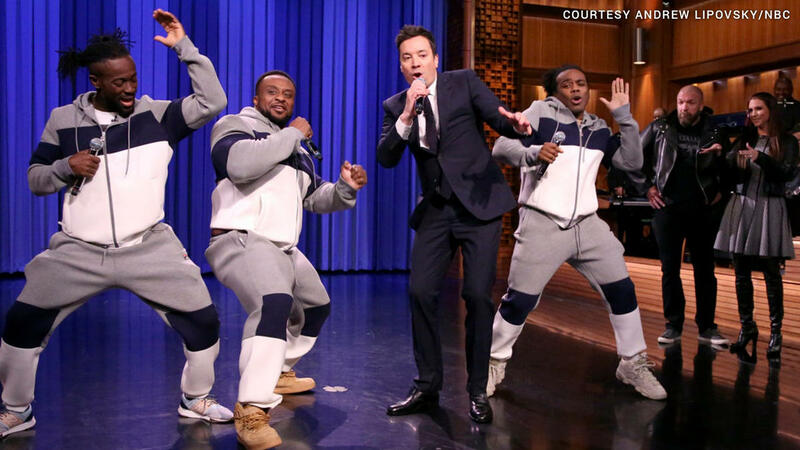 Moreover, Fallon tried to dance with them when his part came on the song, but they tried their best to simultaneously add the moves with the singing. In the end, the audience was quite amused with their performance, and it was Triple H and Stephanie’s turn. When Stephanie informed the audience and Triple H what song she picked, he seemed very reluctant, as if he did not know the song. When the song was randomly chosen between the two selections, New Day felt more confident that they were going to win. Moreover, Fallon felt more comfortable that he was going to win the bet that was agreed upon before the lip sync battle. The bet was, if Triple H and Stephanie won, Fallon would have to appear at the 25th Anniversary of Raw. However, if Fallon and New Day won, Fallon did not have to. The “How Far I’ll Go” song started, and Stephanie was in a full-on theatric mode as she lip-synced. Then, she handed the microphone to Triple H. In what was a major shock to the audience, and especially Fallon and New Day, not only did Triple H know the song, but he was even more animated than Stephanie was. In the end, Triple H and Stephanie won, and Fallon will be appearing in Brooklyn at the Barclays Center this coming Monday.